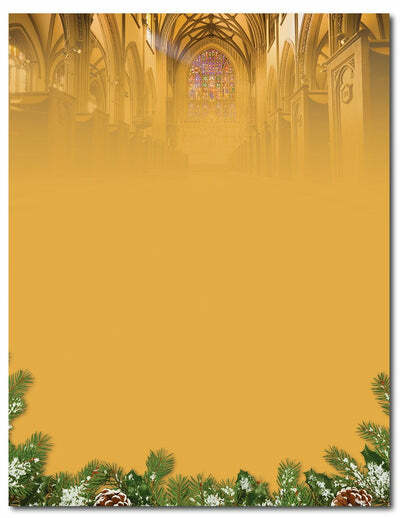 This Christmas Cathedral Letterhead is truly stunning! This holiday stationery paper features a captivating looking of a church at the top and branches of a Christmas tree at the bottom. The wide open center is the perfect space for any holiday message. Use this holiday stationery to send your Holiday Party invitations or annual Christmas Letters! This Christmas Cathedral Holiday letterhead is made from a 50lb Text paper stock that is inkjet & laser printer compatible. Each sheet of Christmas letterhead paper measures the standard Letter size of 8 1/2" x 11".